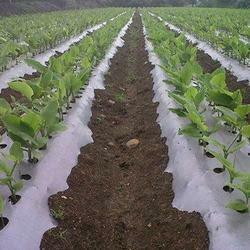 We are a leading manufacturer and exporter of Mulching Film. These are manufactured using high quality plastic and are highly demanded in agricultural sector. We offer these agro mulch films at highly reasonable rates to our clients. We are a leading exporter and supplier of Mulching Films. We know that India largely depends on agriculture and its 70% to 80% population sustains on agriculture. Farming faces problems of weed, insect and pests which grows very rapidly. Farmers are using different chemicals to control them, however they are not so remunerative and they also harms the soil. In this fast growing / changing era, farmers are now using mulching films to keep pace with time and for better returns against inputs and so also for modernization. 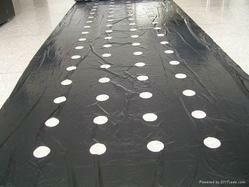 We are a leading manufacturer and exporter of Mulching Film. These are manufactured using high-quality plastic and are highly demanded in the agricultural sector. 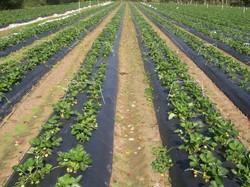 We are a leading manufacturer and exporter of Plastic Film For Agriculture. These are manufactured using high-quality plastic and are highly demanded in the agricultural sector. Mulch Film is a protection cover over the soil, primarily to modify the effect of the local climate. The most powerful feature of plastic mulch is the impact it has on light. Light is responsible for creating both, heat and color. Plastic mulch can impact the development of heat increasing or decreasing it, depend on color. The soil temperature in the planting bed is raised, promoting faster crop development and earlier harvest. Fertilizers are optimally used and not wasted. Soil compaction reduction: The soil under mulch remains loss and well aerated. Root pruning eliminated: due to cultivation eliminating. Cleaner vegetables product: no soil is splashed onto the plant and fruit, resulting, clean product. The mulch film blocks the photosynthesis light. The weeds can''t survive under these conditions. 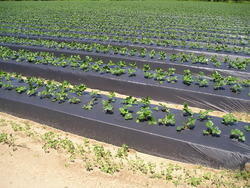 Black and Silver Mulch film is a protection cover over the soil, primarily to modify the effect of the local climate. The most powerful feature of plastic mulch is the impact it has on light. Light is responsible for creating both, heat and color. Embossed Mulch Film is a protection cover over the soil, primarily to modify the effect of the local climate. The most powerful feature of plastic mulch is the impact it has on light. Light is responsible for creating both, heat and color. 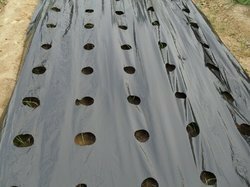 Mulch Film is specifically designed in order to prevent heat from reaching the plant''s roots, thus keeping it cool for faster growth.The most powerful feature of plastic mulch is the impact it has on light. Light is responsible for creating both, heat and color. Our offered films are available in different specifications like thickness and length so as to cater the needs of our clients. Sizes and rates are available on request. To maintain micro environment in soil. To improve soil height and conserve the same. Mulching Sheetis a protection cover over the soil, primarily to modify the effect of the local climate. The most powerful feature of plastic mulch is the impact it has on light. Light is responsible for creating both, heat and color. Plastic mulch can impact the development of heat increasing or decreasing it, depend on color. Soil compaction reduction The soil under mulch remains loss and well aerated. Root pruning eliminated due to cultivation eliminating. Cleaner vegetables product no soil is splashed onto the plant and fruit, resulting, clean product. The mulch film blocks the photosynthesis light. The weeds can't survive under these conditions. Silver and white reflect light. Reflected light seems to prevent Aphids from seeing the plants. Yellow attracts whitefly. 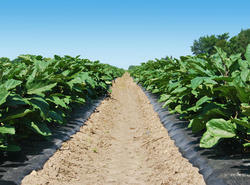 Mulching Filmprovides an economical and environment friendly protective solution for crops and soil. It is widely used in agricultural farms to maintain the quality of soil. In addition to this, it also aids in the faster growth of plants. The film reflects light, ensuring effective control on growth of weeds as photosynthesis process will not be carried out. The high quality plastic used in the manufacturing of film is highly advantageous in locking in moisture that further results in less water evaporation. Mulch Filmis specifically designed in order to prevent heat from reaching the plant's roots, thus keeping it cool for faster growth.The most powerful feature of plastic mulch is the impact it has on light. Light is responsible for creating both, heat and color.